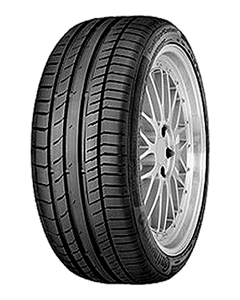 Composed of the same Black Chilli tread compound as the standard Continental SportContact5 tyres, the Continental SportContact5 SUV XL tyres display identical performance characteristics. You can look forward to reduced braking distances on wet and dry surface and improved grip and cornering stability. Reduced stopping distance is of course an essential safety parameter. And increased cornering stability confers greater confidence in the driver while negotiating tricky turns, particularly at high speeds. And this takes on added significance for SUVs, which are by nature heavier and especially if they are carrying heavy loads. The asymmetric tread pattern of the Continental SportContact5 SUV XL tyres comprises 4 wide circumferential grooves, which efficiently deflect water from the contact patch, reducing the risk of aquaplaning and increasing safety on wet surface. Because of their innovative tread compound, the Continental SportContact5 SUV XL tyres exhibit significantly lower rolling resistance. Therefore fuel utilisation is more efficient, resulting in higher mileage performance. SUVs are not particularly known for their ride comfort. With the Continental SportContact5 SUV XL tyres, however, you can expect an exceptionally smooth ride that enhances the overall ride experience.